What is in THE ADDRESS Magazine Volume 24? Superbly curated content, Volume 24 of THE ADDRESS Magazine takes a stylish view, showcasing some of the world’s most beautiful homes for sale as well as inspirational travel and lifestyle related content. With 496 pages, the oversized glossy magazine showcases an edited selection of luxury real estate and luxury homes for sale in some of the most important luxury property markets in the world. From prestigious resort vacation homes on exotic islands to exclusive country homes in areas of outstanding beauty; from fine city living in a prestigious address to perfect weekend getaways and summer houses, browse THE ADDRESS Magazine and discover a range of luxury properties, from elegant apartments to family homes for sale throughout the world. With a focus on everything that makes travelling spectacular – food, chefs, culture and more – Food & Travel belongs on the must-read list of any travel enthusiast and foodie. Moreover, the stylish magazine brings its top picks when it comes to fine living and well-being; from new finds to classic favourites. Dreaming of a tropical retreat, THE ADDRESS Magazine offers the opportunity to buy your own slice of paradise in the Maldives. The Private Residences for sale at Soneva Jani will be among the most exclusive holiday homes in the world. Located on the unspoilt Medhufaru lagoon in the Noonu Atoll, – renowned for its beauty – Soneva Jani will be an indulgent boutique hideaway that takes luxury to new levels. Discover the Tuscany of your dreams and buy a historic home near the sea in this fabled region of Italy. Owning a house on the Tuscany coast is like owning the dream of the finest Italian lifestyle. This historic, luxury villa for sale in the Tuscan hillside is near Lucca and the Tuscany coast, and offers hard-to-find grand-scale living with a privileged setting and sweeping panoramas. Architecture, waterways, history and an impressive cultural programme are the elements that inspire huge numbers of property buyers to invest in Venice real estate. If you are looking for a spectacular example of a heritage-rich property, do not miss these prestige apartments for sale in Venice featured in this issue of THE ADDRESS Magazine. The stunning residences are housed in a restored 15th Century Palazzo, and are only a few steps away from the historic opera house Teatro La Fenice and Piazza San Marco. The Barcelona property market, with the city’s exciting artistic heritage and coveted combination of city and beach, continues to see strong interest from wealthy international buyers. With a cosmopolitan vibe that offers its inhabitants a great quality of life, Barcelona real estate buyers appreciate the ease of access, the climate, the gastronomy – and, of course, the art. This issue of THE ADDRESS Magazine features a stunning selection of luxury Barcelona homes for sale including an exceptional family villa for sale in Valldoreix, an exclusive duplex apartment for sale on Avenida Diagonal, an impeccable palace property for sale in Pedralbes, and a rare modernist building for sale Quadrat d’Or. Madrid is a cosmopolitan city that combines the most modern infrastructure with a vast cultural and artistic heritage. It also offers an incredible lifestyle, reputed international schools and fantastic transport connections worldwide which makes it a greatly attractive destination for international families relocating. THE ADDRESS Magazine showcases some fabulous Madrid properties for sale including an impressive villa for sale in Aravaca, an exclusive villa for sale in La Finca, and a luxury villa for sale in La Florida. Political stability, great weather, incredible natural beauty, high-quality healthcare and lovely people are all factors contributing to Costa Rica property’s surging popularity as an international favourite destination spot. Costa Rica is home to a diverse range of luxury properties for sale including beautiful beachfront estates, ocean-view homes, mountain retreats, and luxury city condominiums. This issue of THE ADDRESS Magazine features a splendid collection of Costa Rica properties for sale such as a sensational oceanfront mansion for sale in Guanacaste, a neoclassical plantation-style mansion in Escazú for sale with spectacular valley and mountain views, and a property overlooking the Central Pacific Coast for sale. Despite being the second-largest island in the Mediterranean, Sardinia has retained its hidden-gem allure, with a real estate market full of untapped potential. Sardinia property for sale offers an opportunity to buy into the rich history and culture, unbelievably beautiful landscapes and laid-back way of life of this truly spectacular island. In this issue, we have a wonderful collection of fine properties for sale in Sardinia, such as a splendidly panoramic villa for sale in Costa Rei, an elegant villa for sale near Cagliari, and a luxury Costa Smeralda villa for sale. From medieval towns and fishing villages to open-air markets, local wine, and some of Europe’s best sandy beaches, Algarve is one of the world’s best place to live or retire to. Add pleasant climate, exceptional quality of life and excellent accessibility, and it is easy to see why Algarve property is so popular with lifestyle investors. This issue of THE ADDRESS Magazine features a high quality selection of luxury Algarve homes for sale including a splendid country mansion near Almancil with sea views, a large family villa near Santa Barbara de Nexe, and a Vale do Lobo Algarve luxury villa with pool for sale. 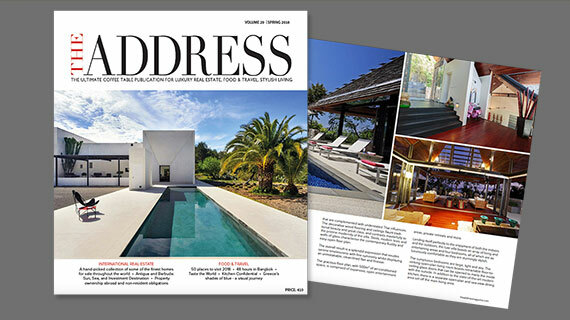 Also, in this issue of THE ADDRESS Magazine readers will find a lavish property for sale within the exclusive Moonshine Ridge community at the prestigious Apes Hill Club, Barbados; a modern villa for sale in Jávea, Alicante; and a historic property for sale on the Barcelona-Maresme Coast. The market insight features in this issue include "UHNWIs – Where in the world? ", "New Global Index Ranks the Quality of Our Nationalities", and 8 Property Market Insight articles. Travelling in West Africa is an unforgettable experience and is frequently at the top of the favourites’ list of many of the most well-travelled people in the world. West Africa has magic and soul. Home to African landscapes of our imaginations and inhabited by an astonishing diversity of traditional peoples, this is Africa as it once was. The Adriatic coast of Montenegro and Croatia is a traveller’s dream: idyllic coastline, wonderful weather, stunning heritage-listed walled towns, beautiful islands and secluded bays. Here a fascinating adventure unfolds as Old World Europe reveals its charm. For your passport to stylish discoveries, do not miss some of our top holiday home rentals in Europe and beyond in this issue. Specialising in unique vacation homes, Select Retreats of the World handpicks vacation rentals and small hotels that are truly original and special. You can find a preview in THE ADDRESS Magazine of some of the holiday homes to rent that we have selected on the French Riviera, Provence and Phuket. The foodie inspired luxury lifestyle publication features in each issue profiles and interviews with a leading chef, plus two signature recipes. Talented chef Cat Ashton sits down with THE ADDRESS Magazine to talk about favourite ingredients, inspirations and culinary expeditions. Curated is a section of the magazine dedicated to recent discoveries for stylish living, travel & holiday, kitchen & dining, and well-being & beauty. Finally, explore the visual and musical tribute to the Arctic. Watch the video where world-renowned composer and pianist Ludovico Einaudi performs one of his own compositions on a floating platform, against a dramatic backdrop of the massive Wahlenbergbreen glacier in Norway’s Svalbard.